On November 29, 2013, Russia’s Progress M-21M resupply vessel had to be manually docked to ISS, due to the failure of the spacecraft’s Kurs-NA automatic docking system. The press release from Energia, the enterprise that developed both the Progress space vehicle and Kurs-NA system, stated that “the fly-around maneuver and stationkeeping were performed in automatic mode, while the final approach operations were controlled from onboard the space station by the Russian cosmonaut O. Kotov,” leaving the cause of the malfunction open to question. The Progress M-21M cargo vessel, carrying almost 2.4 tons of food, fuel, and supplies, had been launched by a Soyuz launcher from Baikonur Cosmodrome on November 25. Since 2012, it is the norm for the Russian supply vessels take the less fuel-efficient “fast lane” to approach ISS only 6 hours after lift-off; earlier flight paths had required two days to reach the station. Progress M-21M had even a longer ride, spending four days in orbit before approaching the station. It followed this extended trajectory to allow time to perform a flyby within a 1.5 km of ISS and transmit its onboard data of the new Kurs-NA system to the station. 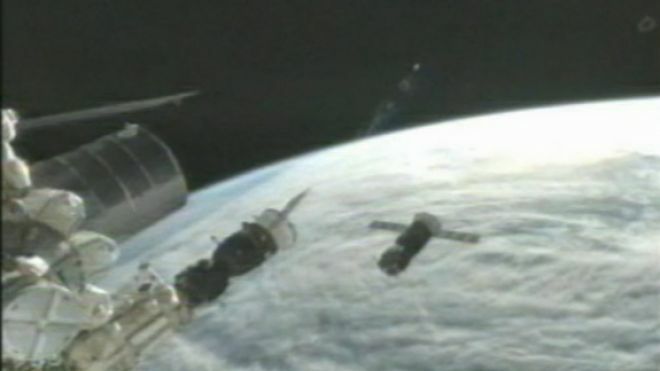 ATV-3 docked to ISS as photographed from the departing Soyuz TMA-22 (Credits: NASA). As the only occupied human habitat currently in space, the International Space station is visited and supplied by several spacecraft. In the post-Space Shuttle retirement era, six different vessels remain in operation to support ISS: Russia’s Soyuz TMA and Progress, US’s commercial Dragon and Cygnus, Europe’s ATV, and Japan’s HTV. Crew transfers to the station are performed only by the Russian Soyuz capsule; all the other spacecraft serve as cargo resupply vessels. In terms of docking approaches, both of the Russian spacecraft use the “Kurs docking system” for an automated rendezvous with the station. The system detects the ISS from a long distance (around 200 km) and orients the spacecraft for an efficient docking. In case of emergency, the ISS crew can override the system and take command of the vehicle to perform a manual docking. The docking system of ATV (Autonomous Transfer Vehicle) is also autonomous, as its name implies. This system uses GPS to orient the craft up to 250 m ahead of the station, then two videometers and two telegoniometers completes the rendezvous. For any last-minute problems, ATV also has a manual navigation system which can be activated from the station. Japanese HTV (H-II Transfer Vehicle) and American commercial crafts approach the ISS in several stages, and are signaled by ISS crew or ground control to continue from one holding point to the next. Once they reach their closest parking orbit to the ISS, crew grip them manually using the robotic arm (Canadarm2) and berth them to an available docking port. Russia has been developing its new docking system, Kurs-NA, for several years. This new version houses advanced electronics, a fully-digitized control system, and provides increased docking precision compared to its analogue predecessor. The new system also employs only one-antenna, instead of 5 as it was in the older version. These updates aim to lower the power consumption of the vehicle, and also improve the safety of the docking procedure due to simplification of the overall structure. Progress M-15M successfully completed second and third rendezvous stages before failing to dock with ISS on July 24 (Credits: NASA). The Kurs-NA system had been tested in July 2012 for the first time, during the Progress M-15M flight. For that mission, the Progress vehicle had both the analogue Kurs system and the new Kurs-NA aboard. 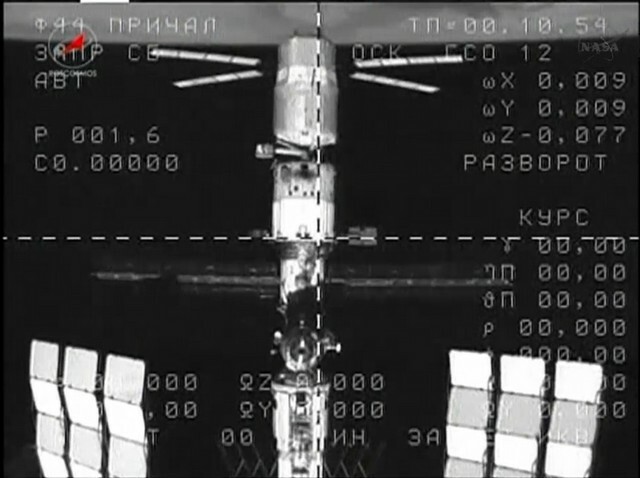 During the first docking attempt on July 24, 2012, the updated version of the system had disabled the subsequent operations at a distance of 161 km from the station, so the rendezvous had to be suspended. It was discovered that the problem was caused by lower than expected temperatures on the spacecraft. To resolve the issue, engineers turned on all available heaters on Progress M-15M, which in turn resulted in Kurs-NA activating successfully, paving the way for a successful automated docking on July 29, 2012. However, the November 29, 2013 test was still critical, since this time, the new system was directly in control of the docking operation without any onboard backup (analogue Kurs) option. That is why, the teams had to take the system under manual control from the station. Russia was planning to implement the Kurs-NA system to all the Progress and Soyuz craft in the future, however it seems that the system will need some more testing before becoming a standard for these vehicles. In the long run, Russia also has intentions to replace both of its spacecraft with newer designs, namely PPTS and Parom.